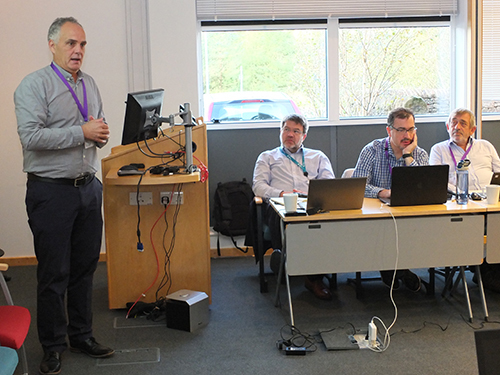 Buxton (England), September 21st – The annual General Meeting of the HySafe members was held on September 21st in Buxton (Derbyshire, England) at the Health and Safety Executive (HSE). This assembly was the conclusion of a busy week of meetings of very general kind, but all of them having to do with hydrogen safety. One agenda item was the election of a new HySafe president and a new chair of the PR and Dissemination committee. Before this outgoing president Thomas Jordan gave his report on the activities of the year since the last General Assembly. He highlighted that the ICHS 2017 was a success, both scientifically and financially. Now the challenge is to prepare ICHS 2019 such that the success is repeated. The assembly approved the report of the activities of board and discharged both the president and the outgoing PR and Dissemination chairman Ulrich Schmidtchen. 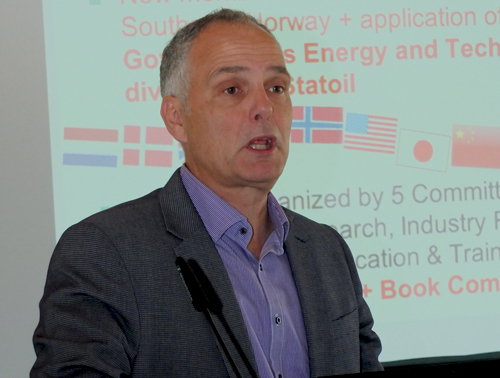 Stuart Hawksworth from HSE’s Centre for Energy was elected new president of the International Association for Hydrogen Safety. He said that it is a great time to be president, as hydrogen development is now in an important phase and starting to realise its true potential for a number of applications in the energy system and transport. He acknowledged that the work of the Hysafe community has significantly contributed to these developments so far, and moving forward he is certain it will make an even greater contribution to ensure that future development occurs smoothly and safely. 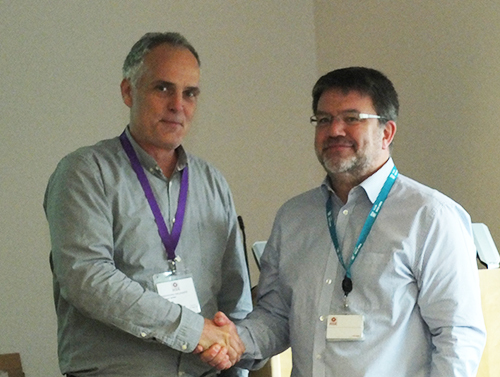 Olaf Jaedicke from Karlsruhe Institute of Technology was elected as new PR and Dissemination chairman. The next International Conference on Hydrogen Safety (ICHS) will be held from September 24 to 26 2019 in Adelaide, South Australia. Preparations are of course under way since months ago. 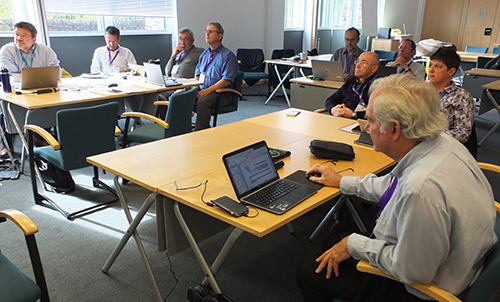 On September 17, 2018 the Scientific Committee of the conference held a meeting in Buxton (Derbyshire, England) at the Health and Safety Executive to review the state of things and to prepare further steps. 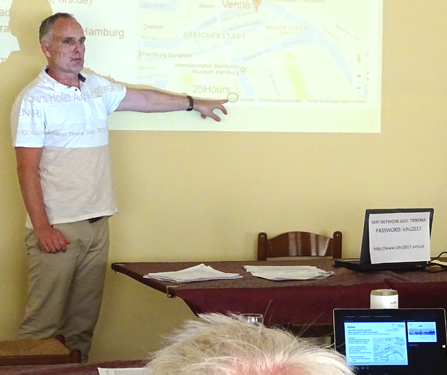 The balance of the conference held im Hamburg last year was presented and approved. Details of the conference venue, the program structure, the schedule for the preparations and other things were discussed. We look forward to meeting you “downunder” in September 2019! Save the date for ICHS 8! The 8th International Conference on Hydrogen Safety (ICHS 8) will be held from 24.-26. September 2019 in Adelaide, South Australia, Australia. O. k., please do not complain that you have not been warned. 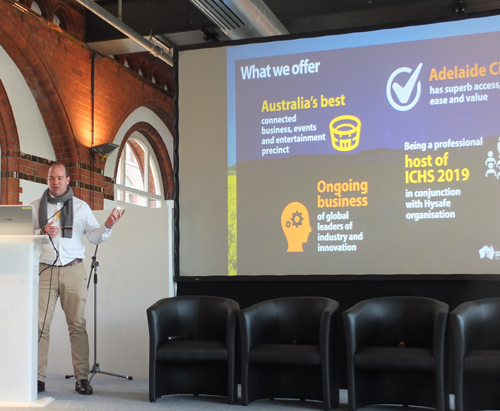 The project to have the next ICHS in Australia was clearly announced at the closure of ICHS 7 last year in Hamburg. You missed this? Then make sure that you will not miss the next ICHS as well! Posted on April 3, 2018 April 3, 2018 Author Ulrich SchmidtchenCategories Association life, Conference, DisseminationLeave a comment on Save the date for ICHS 8! Hamburg, 14. 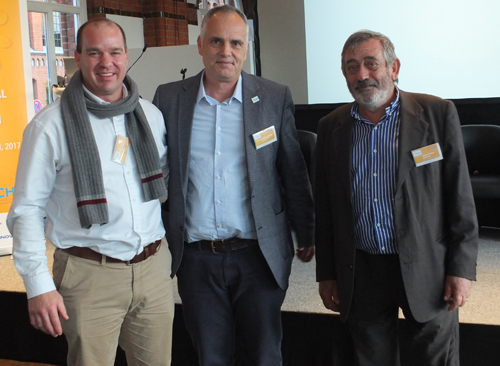 September 2017 – The annual General Assembly of the HySafe members, which was held today on the day after the closing of the International Conference on Hydrogen Safety, unanimously re-elected the board members whose term expired, namely Thomas Jordan (president), Hervé Barthélémy (vice president), Frank Markert (secretary), Iñaki Azkarate (treasurer) and Marco Carcassi (conference committee). 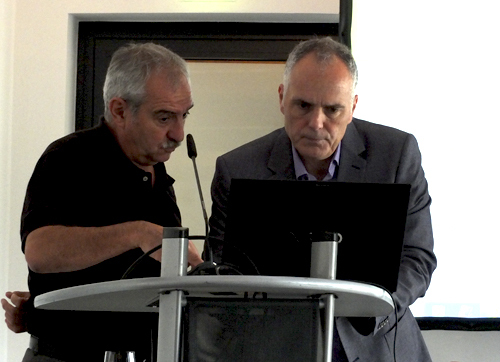 Thomas Jordan and HySafe treasurer Iñaki Azkarate check where the HySafe money went. Good news: they found it! In his report on the last year Thomas Jordan said that the membership of HySafe has increased; two new members were admitted during the meeting. That the ICHS 7 had been a success needed little explanation because everybody had witnessed this during the three days before. An important part of the work in the months to come will be the support for the European “Hydrogen Safety Panel” to be founded soon by the FCH 2 JU. 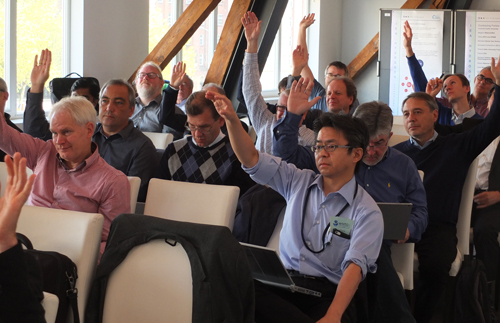 Another item was how the work of IEA Hydrogen should be supported in the future. Hamburg, 13. September 2017 – The 7th International Hydrogen Safety Conference was closed today after another day of technical papers, among them several about the outlook for the technology. Experts from UK, Germany, and USA gave an overview about achievements and expectations for their respective country. The focus was on storage of large amounts of hydrogen and its use in the existing natural gas grid. 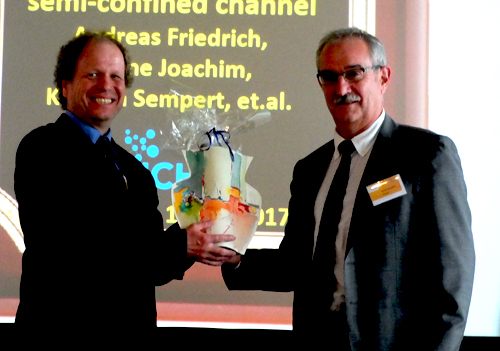 During the closing session Andreas Friedrich and his co-authors were awarded for the best paper, a contribution on “Hydrogen combustion experiments in a vertical semi-confined channel”. 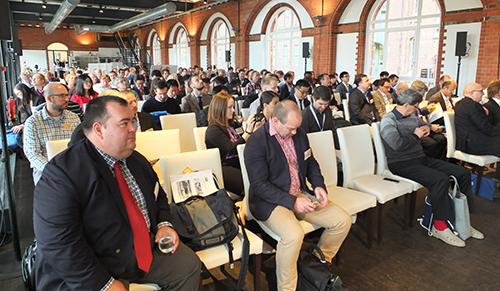 165 participants from 22 countries had attended the conference. 105 papers had been presented in 17 sessions. The number of participants was a bit below that of earlier conferences, the number of papers a bit above. Obviously the ICHS has meanwhile stabilize, and the outlook for 2019 is optimistic (though the travel costs for many participants will be higher than this year, see below). After the conference is before the conference. Where will the next ICHS be held? 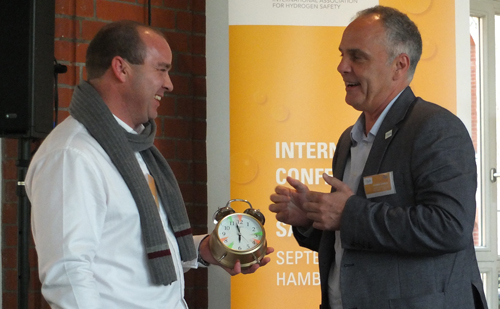 HySafe president Thomas Jordan announced that ICHS 8 will be held in Adelaide, South Australia. Nick Smith, representing the state energy department, introduced the state capital to the participants making clear that the ICHS would be a valuable support for the plans of the state government in terms of hydrogen as part of a sustainable energy system. Hamburg, 12. 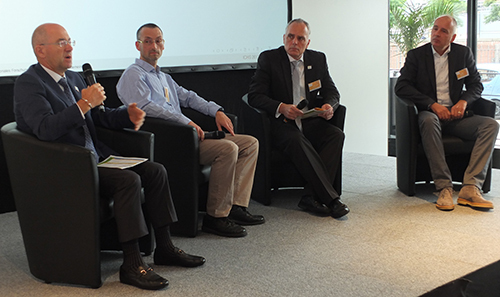 September 2017 – Among the highlights of the second day of the 7th International Conference on Hydrogen Safety there was a panel about how to make hydrogen safe and (above all) let people know about it. HySafe does a lot of work to this end on a global basis. 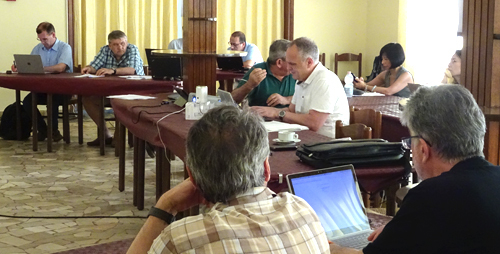 Every other year international experts meet for a Research Priorities Workshop. The last was held last year in the Netherlands. Jay Keller, HySafe Board member, presented the results as they are now and anncounced that the final report will be available in the near future. Safety is not just a matter of technics. Building public acceptance also requires a lot of psychology. Experts from this field gave their opinions how to proceed to make hydrogen as trustworthy for the general public as elevators. Hamburg, 11. September 2017 – An European Hydrogen Safety Panel will be formed soon which will assist the FCH2 JU at both program and project level in assuring that hydrogen safety is adequately handled. 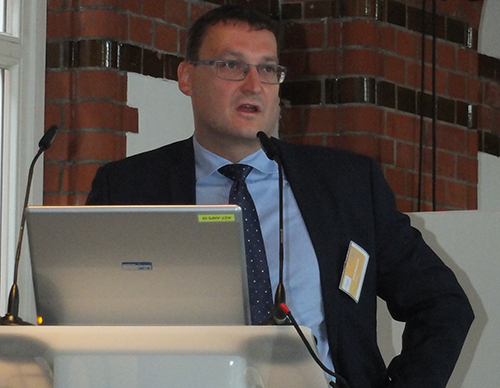 This was announced today by Bart Biebuyck, Director of FCH JU during a speech to the participants of the 7th International Conference on Hydrogen Safety. 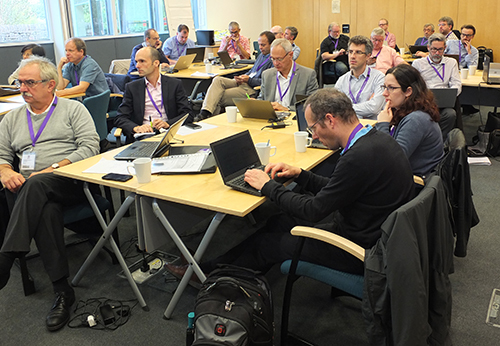 The European Hydrogen Safety Panel will assist FCH 2 JU in several areas: on Project Level, Program Level, Public Outreach and in the maintenance of HIAD (Hydrogen Incident and Accident Database). It is expected to contribute to a FCH 2 JU proactive safety management and to promote and disseminate a hydrogen safety culture. Hamburg – 11. September 2017: The 7th International Conference on Hydrogen Safety was opened today. 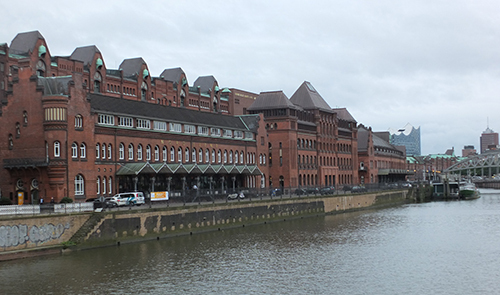 The venue this time is the former main customs office of the port of Hamburg. 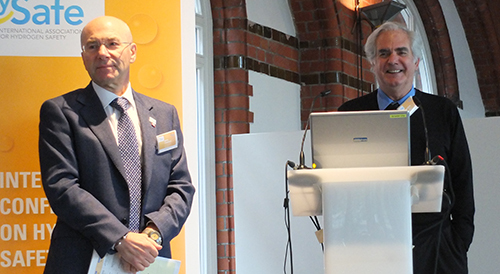 HySafe president Thomas Jordan welcomed the participants to the first conference of this series held in Germany. 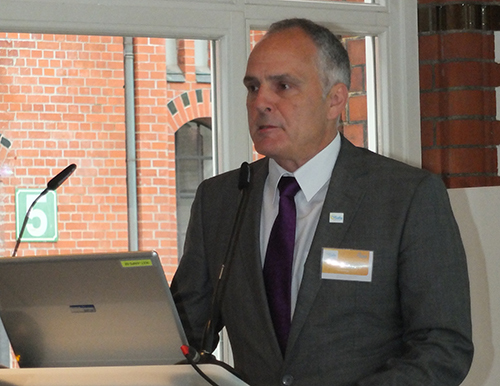 Welcome messages were also given from the city of Hamburg and from the National Organisation for Hydrogen Technology (NOW). The conference started with a political plenary session in which position from Germany, the EU, the USA, Japan, Australia and the recently founded Hydrogen Council were exchanged. Until Wednesday the participants will discuss the topic of hydrogen safety from all its sides. 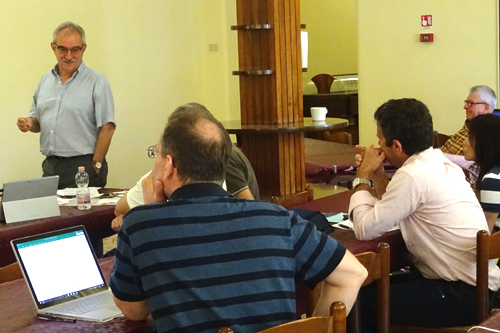 During a meeting in Tirrenia (near Pisa, Italy) on May 29 and 30 the Scientific and the Organzing Committee of the International Conference on Hydrogen Safety (ICHS) made the final preparations concerning the program of the next conference to be held im September in Hamburg. 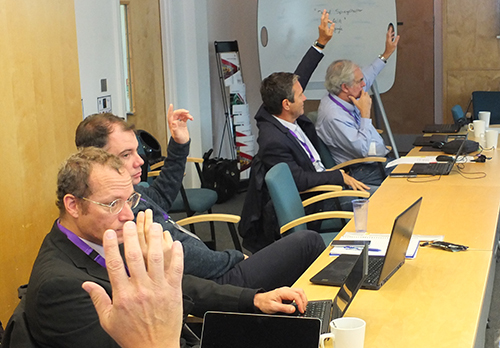 The last decisions were made which papers to accept and how to put them into plenary or parallel meetings or poster sessions so that a reasonable program comes out. This is by no means an easy task, but with joint forces it could be done. Other points around the conference like accomodation etc. were clarified as well. 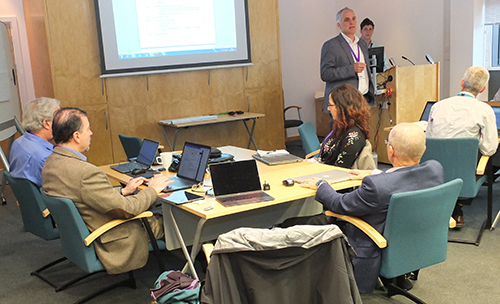 The meeting of the conference committees was followed by one of the HySafe board on May 31 during which the financial situation and the plans of HySafe for the rest of the year (other than ICHS) were discussed.